The 20-Year Performance Of Hedge Funds And The S&P 500 Are Almost Identical. Hedge funds continued to underperform the overall US equity market this year. In the first six months of 2013, the S&P500 index is ahead of the CS Hedge Fund Index by over 10%. That is not entirely unexpected during a bull market however - as was the case in the 90s. Just holding short positions – whether in long-short strategies or as risk-reducing positions – should result in underperformance. 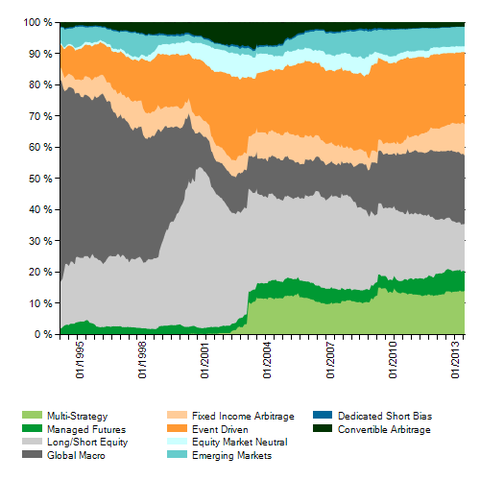 The fact that the hedge fund universe includes credit, fixed income, and other non-equity strategies makes it difficult for a broad group of hedge funds to outperform in a bull market. Here is what the CS Hedge Fund Index breakdown by “sector” looked like over time.